LOS ANGELES -- In an old hangar at the Santa Monica Airport, Louise Anne Marler, a graphic designer who specializes in pop art-style imagery of vintage manual typewriters, is showing off her next subject - a Bing No 2 compact portable. This relic of 1920s German ingenuity was a gift from her father. ‘‘He has a cellar and a barn full of these things,’’ says Marler, recalling how her dad’s collection would spill over into different rooms of the house and become part of the decor as she was growing up. But that was before the word processor and personal computer brought an end to the typewriter. In fact, of all the machines destined for the history books the manual typewriter should probably top the list. But like vinyl records and Polaroid cameras this once ubiquitous technology is capturing the imaginations of young and old with its simplicity. Call it a push back against technology. ‘‘The typewriter does one thing and it does it well: It types,’’ says filmmaker Gary Nicholson, who documents the trend in The Typewriter (in the 21st Century). It opens in select theatres and film festivals starting in September, including a screening at 4pm on Saturday, September 1, at Beyond Baroque Literary-Arts Centre, 681 Venice Boulevard, Venice in Los Angeles - www.beyondbaroque.org. The film, directed by Christopher Lockett, explores the trend from the viewpoint of typewriter repairmen, high-end collectors, teachers, journalists and students. The film also showcases bloggers who type their posts the old-fashioned way, scan the page into the computer and upload it to their blog, authors who derive inspiration from the rhythmic clacking of keys and other enthusiasts who converge in public spaces for type-in gatherings. 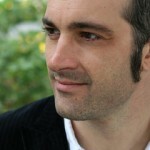 ‘‘There’s this level of thought that writers are returning to the manual typewriter because they can focus on the flow of their story without the distractions of the computer,’’ says Marler, who is featured in The Typewriter movie and behind a type-in at Beyond Baroque on September 23, starting at 1pm. 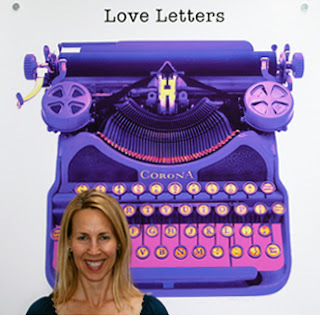 As part of the event, she’ll showcase her TypoWriters and AlphaBits series of fine art prints, starting at $45, that she creates and sells online from her L.A. Marler design studio - www.lamarler.com or 310-449-4477 - in Santa Monica, where she can be found on any given day. Her ever-growing TypoWriters collection features graphically altered images of such typewriter brands as Corona, Royal Bar-Lock and Underwood. They come from her parents’ rural Mid-west house. When she visits, Marler entertains herself with her digital camera, photographing the working-class typewriters that her father - a second-generation office equipment salesman who’s now retired - continues to amass. She Photoshops each image, eliminates the background and plays with the color. She comes up with brief captions like ‘‘Here’s my story,’’ ‘‘Ghost Writer’’ and ‘‘Love Letters’’ to accompany each piece. In her AlphaBits series, she zeroes in on the keys as pop fonts that can be arranged to spell words. 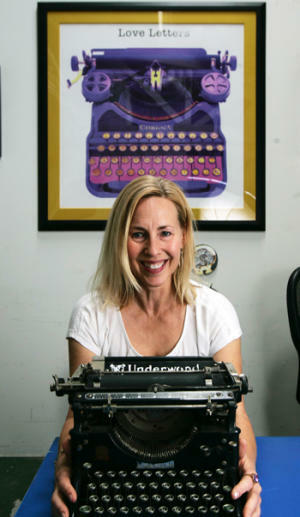 Marler caters to writers but she’s seeing her audience grow as new generations discover the typewriter. Antique and second-hand stores, eBay and online retailers are also feeding the demand with actual typewriters - especially pre-1960s Ernest Hemingway styles and sleek, ultraportable models that sell from $25 to $200, depending on their condition. 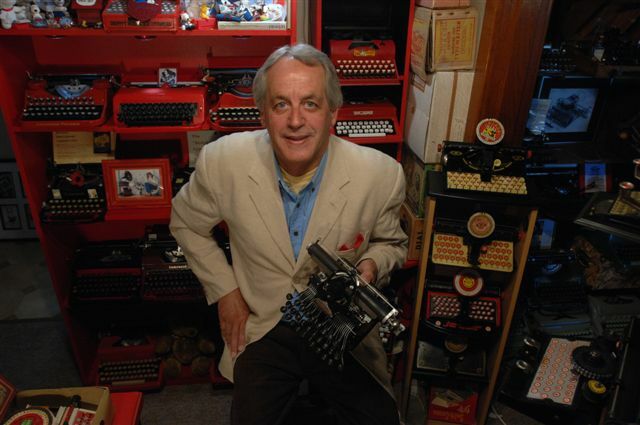 ‘‘I had a couple buy one last weekend for a 50th anniversary party so people could write messages on a typewriter,’’ says Rick Johnson, who co-owns the Sherman Oaks Antique Mall - www.soantiquemall.com - where interest in vintage manual typewriters is gaining momentum, especially among the young. And so the store, which also supplies Hollywood set decorators with props, makes it a rule to keep these machines in stock to meet the demand. ‘‘A trend is happening but it’s not why I’m doing this,’’ says Marler, who chuckles at the response her art used to get from friends just five years ago.